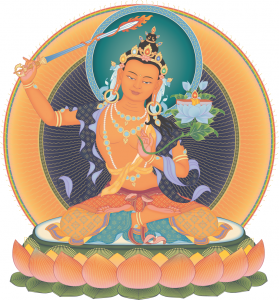 Homage to Venerable Guru Protector Manjushri! At your Heart you hold a Dharma text, showing that you see all ultimate and conventional truths with a wisdom that has dispelled the clouds of obstructions and radiates like the sun. With a melodious speech endowed with sixty qualities, you love like your only child all migrators in the prison of samsara, who are confused by the darkness of ignorance and tormented by suffering. The roar of your speech, like the sound of dragon-thunder, rouses us from the sleep of the delusions, and frees us from the iron chains of karma. Your sword, held aloft, dispels the darkness of ignorance and cuts through all roots of suffering. Pure from the beginning, having accomplished the ten grounds, your princely body in the aspect of a Bodhisattva is complete with all good qualities and the one hundred and twelve marks of a buddha.